On Monday 23 July 2018, after some days of heavy rainfall, the Xe Namnoy Dam in Attapeu province, southeastern Laos, collapsed, inducing flash floods over downstream villages in Sanamxai district. 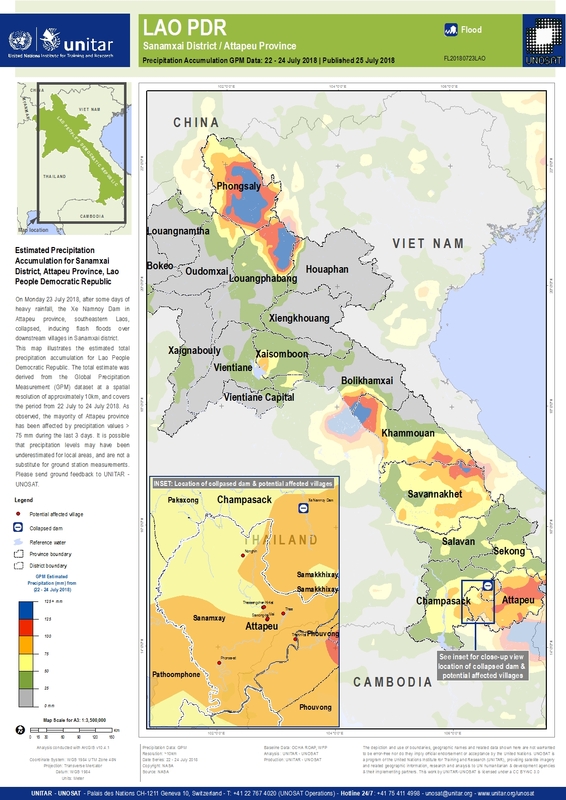 This map illustrates the estimated total precipitation accumulation for Lao People Democratic Republic. The total estimate was derived from the Global Precipitation Measurement (GPM) dataset at a spatial resolution of approximately 10km, and covers the period from 22 July to 24 July 2018. As observed, the mayority of Attapeu province has been affected by precipitation values &gt; 75 mm during the last 3 days. It is possible that precipitation levels may have been underestimated for local areas, and are not a substitute for ground station measurements. Please send ground feedback to UNITAR - UNOSAT.